Monuments in places you might not expect are suddenly up for scrutiny – and vandalism. Confederate monuments are being removed around the country under pressure from those who say they honor a regime that enslaved African-Americans. The pace has increased, however, in the wake of last weekend’s deadly confrontation at a white nationalist rally in Charlottesville, Virginia. 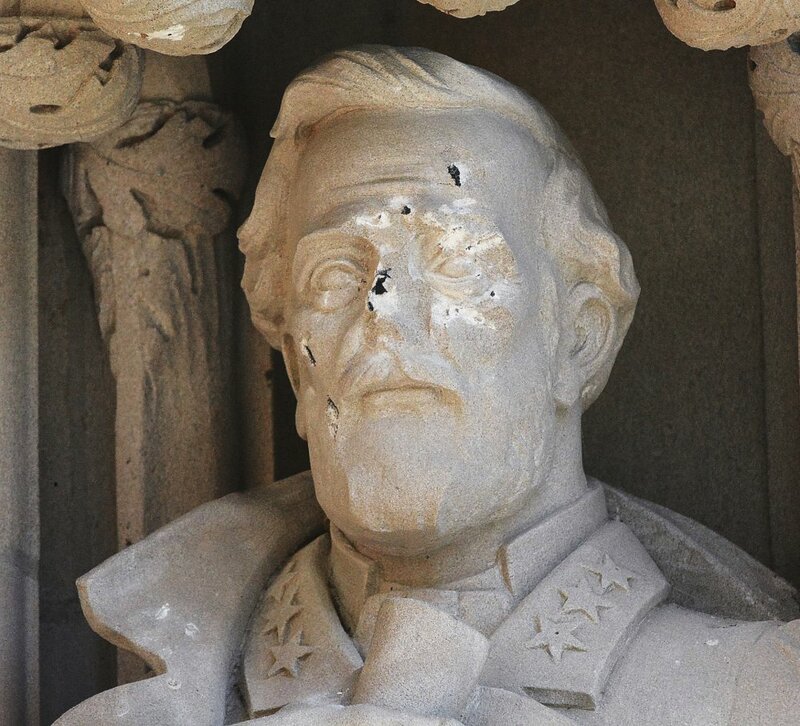 A statue of Gen. Robert E. Lee at Duke University was found defaced on Thursday. The statue in the entryway to Duke Chapel had damage to its nose. Another monument of a Confederate soldier that stood in front of a government office building in town was pulled down by protesters Monday night. Four people have been arrested and authorities say more arrests are planned. Earlier, two statues in Wilmington were defaced with spray paint. A statue outside a courthouse dedicated to Confederate soldiers has been vandalized. Obscenities and other graffiti were spray-painted on the 1908 monument sometime before dawn Thursday. The damage was repaired. A Confederate monument on U.S. 60 near Gold Canyon was found covered in tar and feathers on Thursday. Earlier, the Confederate Troops Memorial outside the Arizona Capitol was spray-painted white. It was the second time in a week that the memorial had been vandalized. Plaques honoring Gen. Robert E. Lee were removed from the property of a now-closed Episcopal church in Brooklyn on Wednesday. Meanwhile, Gov. Andrew Cuomo also called on the Army to rename two streets at nearby Fort Hamilton that honored Lee and Gen. Thomas “Stonewall” Jackson. A 52-foot-tall obelisk honoring Confederate soldiers and sailors was covered by wooden panels at the mayor’s order. The 1905 monument is in a downtown park. The cover-up Tuesday prompted a lawsuit by Alabama’s attorney general, who argues that it violates a new law prohibiting the removal of historical structures, including rebel memorials. Hollywood Forever Cemetery, where many movie legends are interred, removed a 6-foot Confederate monument erected in 1925. The stone and attached plaque stood near the graves of more than 30 Confederate veterans and their families.